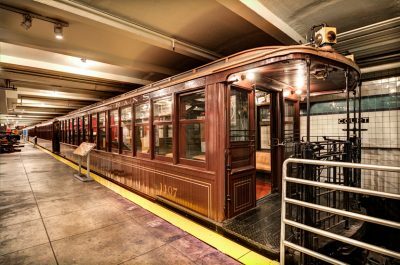 The Press Office at the New York Transit Museum welcomes press and media inquiries. To request a press kit, images, information, or media tour, please contact us at [email protected] or 718-694-1600. If you are a member of the working media and interested in covering Old City Hall Station, please click here to fill out a request form. The Transit Museum is dedicated to telling and preserving the stories of mass transportation—extraordinary engineering feats, workers who labored in the tunnels over 100 years ago, communities that were drastically transformed, and the ever-evolving technology, design, and ridership of a system that runs 24 hours a day, every day of the year.